I just got this for myself. 4 mbps is fast enough for mobile internet and probably faster than most shared wifi options in apartments. What you will receive is a prepaid card which includes this 1 year data plan. To activate it you have to take to any True shop so that they can register it on your name (you have to take your passport there). Calling is 1 THB per minute and of course you have to top up money to be able to do so, it's prepaid. One thing that isn't mentioned there: You have the 1 year internet plan, but the validity of the sim card starts with 1 month, so you have to use it for calling a bit and top up money or it would expire. So for the internet it's 133 THB per month, if you factor in the necessary usage so that it doesn't expire it's maybe 150 THB per month, i think that's the cheapest options available for a reasonable mobile internet package. 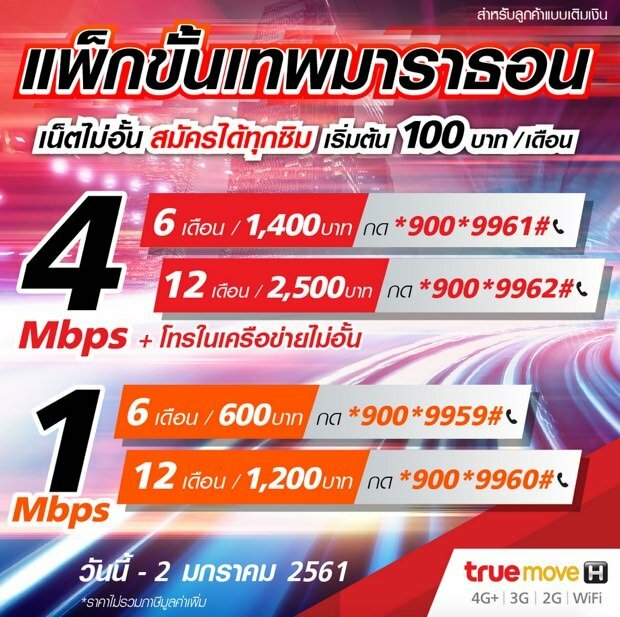 I bought the AIS Net Marathon 4 Mbps SIM for 2,500 baht for one year. They say calls to AIS are 1 baht/hour, for one year, which sounds a bit too good to be true, and I haven't confirmed or found this not to be accurate yet, as I just topped it up and haven't counted down what calls are costing me yet. Before the AIS net SIM I bought the dTAC "Go plern" net SIM, which was a terrible purchase. It was supposed to be an internet SIM for one year and a month after I bought it dTAC completely stopped supporting the SIM; it seems to be only useful for voice calls. 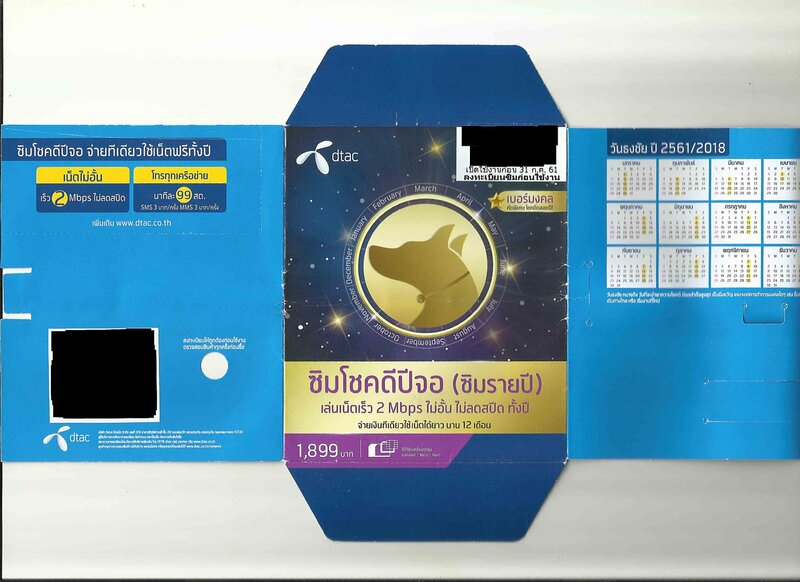 I am so annoyed at Dtac now that I can't wait to throw that SIM card in the trash. The problem is I opened two online bank accounts using my Dtac number, so I have to physically go to a branch of K-Bank and Bangkok Bank first to fill out a form to change my number. And I should probably go to Thai Immigration and update my phone number there, what a drag. How else is Dtac annoying? After they stopped supporting the SIM card they sold me they started to send me spam phone messages regularly to try to sell me internet service at ridiculous high prices. My message to all.......avoid Dtac! The AIS net marathon SIM card is not available at many stores. I bought it directly from AIS online, they mailed it to me, and then I had to go to a Telewiz shop to get the number registered before I could use it. I could select my phone number from a long list of possible phone numbers.....fun for the superstitious seeking a lucky number. The AIS net marathon SIM is also available in a 1 Mbps version for 1,200 baht/year, which I don't recommend because that speed is not the best and voice calls are more expensive on that version. You can port-out your DTAC number to AIS or TrueMove H. This service has been available for many years now, and you will keep your number. It's called MNP, Mobile Number Portability. I have one of these packages but I bought mine directly from True. I use it in a 4G wifi dongle. The validity on my SIM/package (as shown by #123#) is one complete year from the date of activation. My balance is zero and always has been. Before the AIS net SIM I bought the dTAC "Go plern" net SIM, which was a terrible purchase. It was supposed to be an internet SIM for one year and a month after I bought it dTAC completely stopped supporting the SIM; it seems to be only useful for voice calls. I still use "Go Plern" SIM without any problems. Only one little annoying thing: they periodically send SMS "your internet speed is only 64k, but you can buy bla-bla-bla". However not so often, so I don't care. The problem is I opened two online bank accounts using my Dtac number, so I have to physically go to a branch of K-Bank and Bangkok Bank first to fill out a form to change my number. AFAIR, you can change your mobile number at Kasikorn ATM. At least, I done this in 2012 when change mobile number. And, as another people already suggested, you can port your number to another provider. Just come to the new provider's office and claim. They will give you new SIM card and after 3-5 days you number will be moved. Can you give more details on the package as I cannot find it on the True site. You can find discounted versions on Lazada. I have been using DTAC 2mbps package for half an year now as my sole internet connection. I have been generally happy with it. Here is summary what is available. I haven't added True there yet as they have nothing on their official website. As mentioned, it isnt on their site but if you go in and ask for it they know all about it (in the big shops anyway). I find it very handy with the 4G wifi dongle as it can be used in the car, in hotels, or at home if the broadband is down. The only real drawback to it is that it apparently cannot be added to an existing number/SIM card, at least not with mine: I tried in two different shops and no one could do it, even after calling head office. You just have to get a new SIM and a new number. But if you are using it in a dongle or in a dual-SIM phone that's not a problem. It could. It just needed to be a specific kind of SIM in the first instance. 4G Net SIM. hello, so can I know which carrier has the cheapest offer ? thanks. Hi. Just noticed that all 3-months or 1-year Internet On-Top package sseem to have disappear from the AIS website ? ?